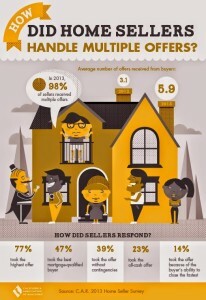 I saw an infographic this morning titled "How Did Home Sellers Handle Multiple Offers?" that was published by the California Association of Realtors, and it makes for a timely article for people who are selling a home in Tallahassee. While our market is not "on fire" like many markets in California, we can usually look to the current California real estate market to determine where ours will be in the coming year or so. What first caught my eye was that they reported 98% of home sellers there received multiple offers, which I find incredible to say the least. Infographics are a great way to use pictures to tell a story. We publish a monthly infographic to show the state of the Tallahassee real estate market, and the feedback we have received on its format is very positive (click here to see the Manausa Market Infographic). The story that we get from California is that the market is so hot, people are standing in line for the opportunity to buy a house. Buyers apparently far outweigh sellers there. Call me skeptic, but I think they should double-check their figures before broadcasting that 98% of sellers received multiple offers. How exactly did they measure that? They claim that sellers, on average, received 5.9 offers from buyers in 2013, and 3.1 offers from buyers in 2012. Regardless of the number received though, home sellers in Tallahassee should be prepared to receive multiple offers and we can look to this California report for some thoughts. Those numbers make sense to me. Home sellers favor more money, but they also favor the stronger buyer. The prudent buyer will ensure they make a compelling offer that demonstrates buyer strength with a very tempting price. The key to getting multiple offers is to understand the liquidity in the market for a home like yours. If you use a progressive home selling plan that properly promotes your home to ready buyers, you will likely generate interest from more than one buyer. This is the best way to get top dollar for your home ... have many people competing for the right to buy it. If you would like to know how a progressive home selling plan can generate multiple offers on your home, just drop me a note and we can schedule a time to demonstrate our plan to you.